Compare discounts for Hotels Motels Resorts in Mesa, Arizona! An eastern suburb of Phoenix, Mesa offers easy access to Tempe and downtown Scottsdale. Main area attractions include Superstition Mountains offering hiking opportunities and the Salt River which is known for having excellent tubing and whitewater rafting. Mesa Hohokam Stadium is home to the Chicago Cubs' spring training program. Note: Lists are not identical. Different sites offer different accommodation options for Mesa. Arizona Golf Resort and Conference Center is a unique, privately owned full service destination resort just 30 minutes from Phoenix Airport. The Hampton Inn Mesa is a four story interior corridor hotel with 118 rooms, located in Mesa, 17 miles from Phoenix International Airport. The Hotel offers an electronic key system, pool and spa. Marriott's award winning economy hotel lodging chain features clean, convenient, quality accommodations and the peace of mind you get from Marriott consistency, all for a great value. La Quinta Inn and Suites Mesa East is featuring 107 distinctively quiet, comfortable guest rooms with rich wood furniture, enhanced lighting, computer-friendly dataport phones and spacious bathrooms. 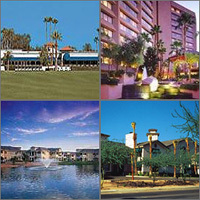 Located in the famous 'Valley of the Sun', 10 minutes southeast of downtown Phoenix, La Quinta Inn and Suites Mesa West is centrally situated near Chandler, Tempe, and Scottsdale, the hotel is close to dozens of world-class golf courses and less than five minutes from Hohokam Stadium, home to the Chicago Cubs' spring training program. The Best Western Mezona Inn is located off of the Red Mountain Freeway on Main Street. The location provides convenient access to all area attractions. The Hilton Phoenix East/Mesa is a dramatic eight story corporate hotel with a resort flair in the heart of Mesa. This hotel is ideally located within the Greater Phoenix area just 10 miles from Sky Harbor International Airport and only minutes away from Phoenix Chandler Scottsdale Tempe and Gilbert. Picturesquely situated on a 10-acre site traversed with walking and jogging paths, Dobson Ranch Inn offers a quiet oasis for relaxing and a convenient location for business and sightseeing all rolled into one. Sleep Inn Mesa features 84 rooms and AAA 1 Diamond hotel rating. In room amenities at the Travelodge Suites Mesa include hairdryer, refrigerator, iron and ironing board, safe, and coffee-maker. Microwave and stove are in some rooms. The Ramada Inn Suites Mesa is located cross the street from Golfland and Sunsplash Waterpark, three miles from the Mesa Convention Center and six miles from Arizona State University. Mesa Super 8 Motel Gilbert Road has 72 rooms in three floors with an elevator.